Both Ayoe and I love salmon. Now I might not be the best cook out there when it comes to cooking fish but I do make my best effort to try. I generally prefer wild salmon over farmed salmon, simply because wild salmon tastes better. You can easily find wild salmon in farmer’s markets or local supermarkets. Here’s a salmon recipe that Ayoe and I tried a while ago. If salmon isn’t your thing you can easily replace salmon with any other kinds of fish. Combine walnuts, mint, garlic, and olive oil in a blender and blend them. Cut the lemon in half and extract juice from one of the halves and add in the sauce. Add salt & pepper to taste. 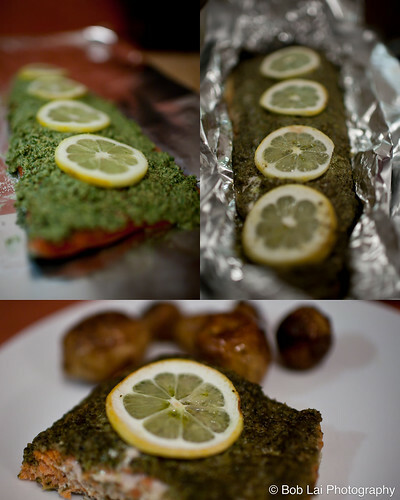 Place tin-foil on baking pan; place salmon fillet on the foil with the skin side down. Spread the sauce on the top side of the salmon. Slice the other lemon half and place them on top of the salmon. Place the salmon in the oven for about 15 minutes. The baking time will depend on the thickness of the fillet. The fillet should be slightly pink in the centre. Serve the salmon with your choice of starch and vegetables. This looks so tasty and seems so simple! I’ll definitely be trying this! You should post the recipe for your vegetable and salmon soup too!! That is always amazing!